Enjoy our first full day in the Holy Land. It’s always great to start with Mass at the Mount of Transfiguration and Fr. Dan did not disappoint us with his homilies at Transfiguration and Cana. Another great day! Fr. Dan’s excellent homily at Beatitudes Here. 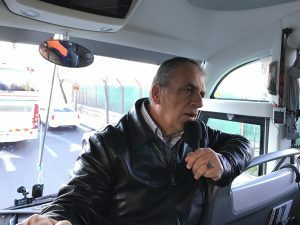 Much of Steve’s talk about Peter at Caesarea Philippi here. Today was Pentecost Sunday which is very special for Janet and I and our family. It was 24 years ago today that we were received into the Catholic Church with tears of joy. My eyes welled up with tears many times today just recalling that event while we’re traveling through the Holy Land. 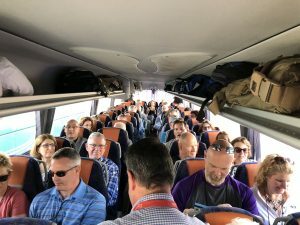 What a joy to share our conversion story with all of the pilgrims on the bus as we drove to Jerusalem. 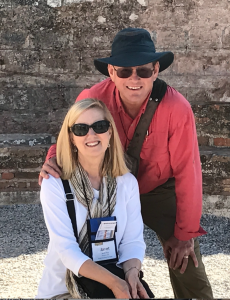 We had Mass at Capernaum and even though it was Pentecost we celebrated the Mass of the Holy Eucharist because it was here that Jesus said “Eat My Flesh and Drink My Blood.“ You can hear Fr. Dan‘s homily here. 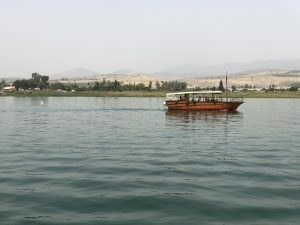 We took a boat ride on the Sea of Galilee, saw the ancient boat from Jesus’s time, are St. Peters Fish and drove to Jerusalem. We stopped along the way at the Church of the Visitation where Mary walked to meet Elizabeth. 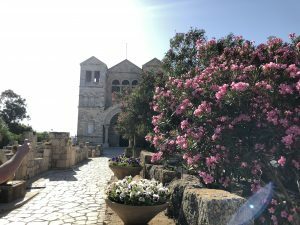 Did you know that young Mary who was only about 14 or 15 years old walked almost 100 miles from Nazareth to the Hill Country of Judea to visit her relative Elizabeth? After singing and praying at the Visitation we arrived in Jerusalem at our Notre Dame Center Hotel. Enjoy! Started with very moving Mass at Gethsemane with lots of tears and a fantastic homily you can watch here. Paternoster Church and Ascension on Mount of Olives. Viewing American flags waiving with Israeli flags in the streets. 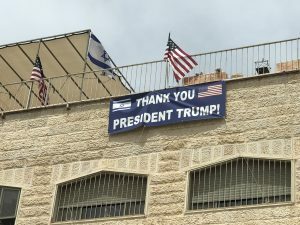 Viewed the new US Embassy in Jerusalem. Lunch at Kibbutz and everything Mount Zion: Dormition of Mary, Upper Room and St. Peter in Gallicantu followed by two hours free time. AMAZING!!! We entered the crowded Holy Sepulchre without lines, escorted into the Tomb with blaring organ and greetings by the Franciscans! You won’t believe it! 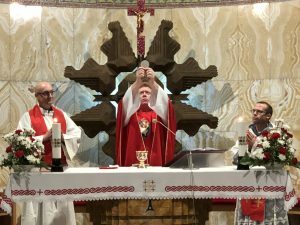 First video covers early morning (3:45 AM – 9:00 AM) Via Dolorosa, touching top of Calvary and Mass at the Tomb — very special and emotional for the folks. Second video covers the rest of the day. Including Western Wall and later dinner on the roof of Jerusalem. You can also download the High Def file HERE. This is a beautiful time of the year to tour the Holy Land. Warm and not hot with almost no chance of rain. We have the best Mass sites selected for you and we will visit every Rosary site and pray that Mystery while there. Join us! 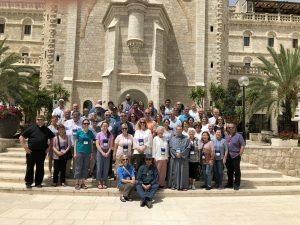 The Ft. Myers Florida Catholic Community invites you to join us on a Holy Land pilgrimage. Enjoy a group of like-minded Catholics the Fort Myers area and around the country for a marvelous pilgrimage through the land of our Lord and Our Lady. Our priest will be one of Steve and Janet’s good friends who has joined them as chaplain numerous times. His name is Fr. 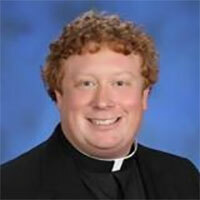 Dan Good from Alabama and everyone loves his fine homilies, devout Masses and his joy and fun along the way.